Case Study : University of Tsukuba / KTW Inc.
Well known in Japan as the first open campus, the medical school group has faced problems with theft and needed to keep records of who was entering buildings and when. As a solution, they chose to install Paxton's Net2 and add to the installation every year. We asked Prof. Naoto Terui, person in charge of the installations at the school, and Ms. Adachi, who manages the use of the system, to tell us about their experience with KT Workshop and Net2. Q. 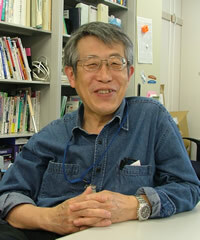 Could you please tell us a bit about the Medical School at Tsukuba University? The Tsukuba University Medical Group. Many people use bicycles to get around. The Tsukuba University Medical School is located on one corner of the Tsukuba campus, which itself is in the center of the 2,700 hectare Tsukuba City Research Park. The Medical School Group is composed of three separate fields, “Medicine”, “Nursing”, and “Pharmaceuticals”, and has a total of about 1,300 students including undergraduates and graduate students. There are a total of 8 buildings belonging to the Medical School Group which about 200 doctors, and 400 other temporary and permanent staff and professors use. Including the students, a total of about 1,900 people are using the 8 buildings. Q. What do you do in the Medical Information Center? We manage all of the information from the Medical School Group as well as manage the network from the Medical Information Center. Stated in standard business terms, we would be the information systems or IT department. Q. Could you tell us about what made you decide to install security doors at the Tsukuba University Medical School Group? a truly open campus with no walls or gates. At our open campus, we don't have any walls or gates. Beyond that, we are always adding buildings and had no real plans for an overall security system. Anybody could come into the campus at any time. From a security perspective, there were a lot of things that we had turned a blind eye to. We had some real problems with PC theft, and then in 2002 someone not related to the university came into one of our research rooms and set it on fire. The whole room was burnt badly and all of the equipment inside was damaged beyond repair. At that time, we did have some security cameras in place, but they didn't catch enough video at the right places to do us any good. We decided that we really needed a more advanced strategy for our security system. The problem was our budget. Q. You mean you didn't have much to spend on security equipment? That's right. At Tsukuba University, each department has their own budget. From that budget, they have to take care of everything. The University doesn't provide extra temporary funding for any projects. That includes security. As we could only use the leftover portion of our budget, our funds were quite limited. However, we realized the need to have a security system. Of course, we couldn't install a complete system right away with our limited budget, so we decided to first pick 2 or 3 places where we could install something and see how it worked. After that, our only option was to keep adding security to a couple of new locations each year. They left the job up to me (Prof. Terui), and I decided to install security on our doors as our strategy. I looked up some access control systems online and picked some of the best looking products from a couple of companies. Q. Out of all the products that you looked at, Tsukuba University Medical School Group chose Paxton's Net2 offered by KT Workshop as your access control system. What were your reasons for choosing Net2? allows for it,” says Prof. Terui. When we were deciding, most of the door security systems were from huge security companies and were very involved. Most of them were priced at 10's of millions of yen. With Net2, we could just install how many units we wanted to and then add later. Plus, it matched our price requirements. With Net2, you only have to change the locks, so we were able to use the doors that we already had. For us, this was a real point. There was no waste and this helped us to keep the costs down. 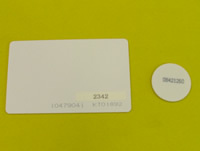 On the student card for Tsukuba University, the student numbers are printed in bar code. We were happy that we could use the cards just as they were*. We could use the student cards for authentication just as they were, so we only had to make new cards for staff who didn't have bar codes on their ID cards. In that way, we saved money as we didn't have to pay anything for the 1,300 cards for the students. For the above reasons we chose Net2, and had the system installed at 3 locations to start out with. We tried it out for that first year and really liked it, so we took a bit from our budget to install more the next year. Q. Please tell us a bit about how you are currently using Net2. As of now, we have Net2 installed on 19 entry/exit doors, 7 classrooms, and 6 experiment labs for a total of 32 locations using Net2. Our 1,900 users are using IC cards or IC patches. When they want to enter a room, they just put their card or patch up to the card reader and it unlocks the door. The IC patch is particularly nice as it is the size of a coin and everyone just keeps it in their wallets or coin purses. Q. Please tell us a bit about the environment into which you installed Net2. At the medical school group, we have a LAN for our internet use, but the Net2 system doesn't use it. For the Net2, we have dedicated cables and an independent network. This way, the Net2 works perfectly even if we have other network troubles. We have a dedicated server in the Medical Information Center from which we use the management software and operate the whole system 24 hours a day. 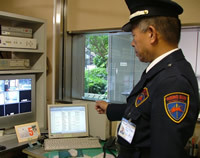 We also have the management software installed in one more computer in the guard room, but that is only used for monitoring..
Q. Do you also have surveillance cameras? We have had a surveillance camera system installed since before we installed Net2. We can monitor all of the video from the guard room. If there is anything unusual going on at the doors, we rewind the video and take a look at the footage. Q. Every year you are installing Net2 on more doors, but how do you decide which doors to do the installations on first? First we consider whether or not there are valuable materials in the room. We also consider the type of equipment in the room. For example, if someone from outside the school tampers with our experimentation equipment in the labs, that could lead to big trouble for us. For those kinds of rooms, security is really important. In the past, we even had some professors who had their own security systems in the rooms, but they were difficult to manage and when the graduate students who had been managing the system graduated, there was no one left to do the job. Now we have installed Net2 on most of those rooms as well. Q. Next, we would like to ask about how you are using Net2. Students graduate and new students come in every year. How do you handle registering new cards, disabling old cards, etc.? We set the cards that we give to the students to be valid for 4 years so that they can use it from when they first enter the school to when they graduate. First we get a list of all of the new students and their student numbers, then we register that in Net2. The information that we register is the card ID, the student number, the student's full name and department that they will enter, and the period of validity for the card. Every year we register about 350 new students including the graduate students. We use the import function, so we can finish all of the work in about half a day. At the new student's orientation, we explain how to use the card, what to do if they lose it or their card breaks, etc. Q. Do you set the card validity at four years for teachers and staff as well? We set the validity of the card to 1 year for teachers and staff. We do the same for temporary researches or visiting professors as well. If they need to use the card the next year as well, we have them submit a form between March and April, and then we can extend the valid period of the card to allow them to keep using it for as long as they need it. Q. Do people often lose or break their cards? They lose or break their cards frequently. In order to avoid improper use of the cards and to protect our students, we tell them to make sure to report lost or broken cards to us as quickly as they can. We can register this in the system. Then, if a card is used improperly, we can find out about it right away. Q. Has there been any improper use of the cards? Up until now, only one time has a card that was registered as broken or lost then been used improperly. The system sensed it and let us know immediately, but we chose not to deactivate the card and instead watched how it was being used. By looking at the usage history of the card in question and matching that up with video taken by the surveillance cameras, we were able to quickly identify the person who was improperly using the card. It turned out to be a student from another department whose computer rooms were always crowded. The student used the card from the Medical School Group in order to use our computer rooms, which were not as crowded. We were really happy that the person who was using the card had no bad intentions, but it was still very important to know that we were able to immediately discover, trace, and then fix the problem of improper usage of the access card. on the monitor in the guard room. Q. How do you respond when a door is forced or left open? An alarm sounds in the security room when this happens and the guard goes to check the situation immediately. Q. How do you handle the maintenance of the system? 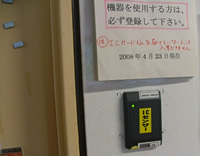 Q. Net2 is installed on entry/exit doors in the school, as well as on some classroom and laboratory doors. How do you manage the access rights on the three different kinds of doors? To start out with, we have granted everyone who has a card access to the entry/exit doors in the school. For the classroom and laboratory doors, we have only granted access rights to those who should be using the rooms. Unlike general business, every individual at the university has different places that they need to access. It's fairly complicated, but that's the reality of a setting up a security system for a university. Q. With every individual having different places that they need to access, it seems like the system would be pretty hard to manage. How is it? We can very easily grant or deny access to each individual and we can make user groups, so it's not as difficult as you would imagine. When students come for entrance exams, we open up all of the doors for the exam time only. When there is some maintenance in the building, we lock up all of the doors. Those kinds of temporary changes to settings are quite easy to do with Net2. It is also really easy to make new cards, so if we have students from another department or professors from another school coming to visit, we just give them new cards that grant them access rights to the areas that they will have to use. Q. Up until now, we have asked various questions about Net2, but could you tell us a bit about the real practical benefits of Net2? The Net2 network doesn't have a central location that all of the doors have to connect to, rather, they are connected like a string of pearls to one another. This is what we call “cascading the doors”. In this way, it is much easier to install the system on new doors because we just link the new door to the closest door that already has the system. This is another way that we are able to effectively keep down construction and set-up costs, and another reason that we chose this system. It really is suited to gradually increasing the size of the overall system over time, just like we are doing. Year by year new updates for the management software are released. We can say that it is getting easier and easier to use the system. This system has really been so convenient for us, that the Animal Resources Center next to the Medical School Group also wanted to use Net2 and just finished installing it a couple of days ago. The Animal Resources Center raises and takes care of the animals used in experiments for the whole university, so many of the Medical School Group's students and researches often go there. The management of their center, and their Net2 system are completely separate from us, but as far as access rights go, students, researchers, etc. who use need access to both the Medical School Group and the Animal Resources Center only need one access card. They don't always need to walk around with two cards. It's really convenient. - If you have any expectations for KT Workshop from now on, please let us know. 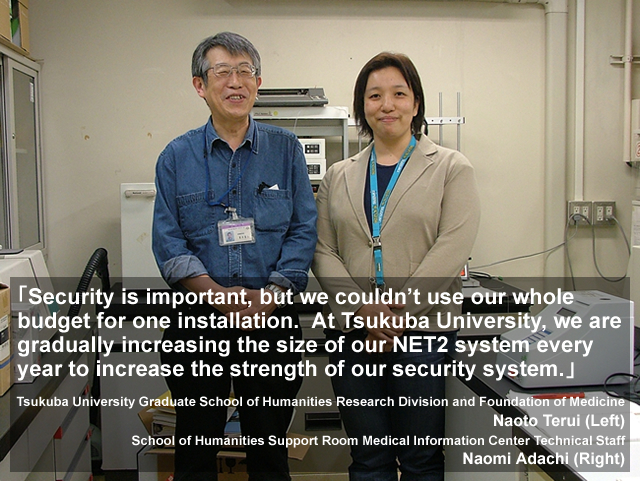 We, the Tsukuba University Medical School Group, plan to continue installing Net2 on more and more doors to make the best security system that we can. We are also considering installing the IP camera system, XProtect™ by Milestone, that KT Workshop offers and integrates with Net2. We would like to continue to get advice from KT Workshop on the best way to create an effective security system, and ask them to keep doing a great job for us from now on as well. Why did the Danish Embassy pick us? Why did the University of Tsukuba pick us?